This review will take a look at two products that are really designed to go together from Seidio; Their Slim Crystal Case and their Rubberized Holster designed for holding a “skinned” or “cased” BlackBerry Curve. As I have stated previously, the Curve is almost too pretty to cover up – but it is too nice not to be protected. The Seidio Crystal Case offers a way of doing both – protecting the body of the Curve while still allowing the color and style to show through. The holster just makes sense for those who like to carry their BlackBerry on their belt and want the features of the “in holster” profile on their BlackBerry. Seidio is one of the world's leading developers and manufacturers of SmartPhone and PDA accessories and enhancements that enable users to utilize their devices to their full potential. 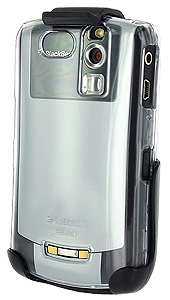 Founded in Houston, Texas in 2002, Seidio has grown into the leading developer and manufacturer of PDA and Smartphone accessories. Seidio offers solutions that enable users to get the most out of their devices, such as extended battery life, outward protection, syncing and charging options, and extended memory for devices. At only 1mm thick, this crystal clear case is designed to perfectly fit the contours and shape of your BlackBerry Curve 8320, Curve 8310, or Curve 8300. The lightweight case is completely transparent and has a smooth surface that not only will protect your phone from everyday wear and tear, but will allow for easy insertion and removal from your pocket or purse. This sleek case has cut-outs for the screen, speaker, antenna, headset port and the keyboard is also left uncovered for easy accessibility. 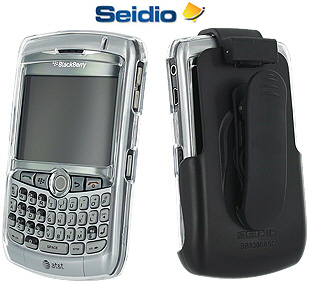 Innovative and well designed, this holster will protect and fit your skinned or cased BlackBerry Curve 8320, Curve 8310, or Curve 8300 perfectly! This holster will allow you to easily remove your BlackBerry Curve 8320, Curve 8310, or Curve 8300 from the top instead of the bottom and your Blackberry is carried facing inward against a soft velvet material safe guarding your phone's screen from everyday wear and tear. This functional holster also includes a 360 degree ratcheting belt clip and has a sleeper function. NOTE: THIS HOLSTER IS FOR A SKINNED OR CASED BlackBerry Curve 8320, Curve 8310, or Curve 8300. 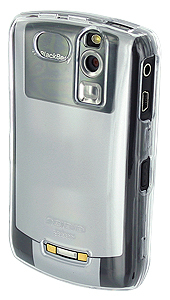 Crystal Case: The Crystal case is designed to be “transparent” in virtually every way. The goal is for you to be able to hold and carry your BlackBerry Curve and keep it protected without it looking or feeling like it is in a case. Now, that is a pretty tall order – but Seidio does a pretty good job here. The case is a two piece design that snaps together around the Curve. Small “clips” on the sides keep the case together – so tightly in fact that this is very difficult to remove. 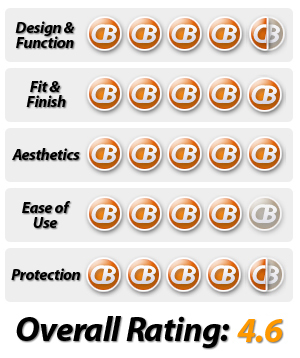 The good news is that all the ports and openings and buttons of the Curve are easily accessible with this case. This clear case seems to be “thinner” than those from the competition. The advantage to that is that the Mute/Standby button on the top was readily accessible as were the convenience keys – this has not always been the case with “hard” case designs. There were also no rough edges on this case – even the openings were smooth to the touch. Holster: The Rubberized Holster is a pretty basic design. The “skinned” or “Cased” BlackBerry inserts “Face In” into the holster and is secured by protruding edges on the bottom and a “clip” on the top. I found the BlackBerry to be quite secure when it was inserted in this holster. On the back of the Holster is a very secure feeling belt clip that rotates for either vertical or horizontal usage. Both the spring mechanism and the ratchet mechanism seem to be quite secure and are made of a quality ABS plastic. One very nice feature is that this Holster includes the requisite “magnet” in the strategic spot so the BlackBerry goes into “holster” mode in your profile. If you are not aware, your profile menu allows you to set the ring/vibration features for messaging both in and out of the holster. By default, the holster is set to “vibrate” instead of playing a tune – assuming you are out in a public place or in a meeting – ut these can all be changed in your profile menu. Crystal Case: The Fit and Finish of the Crystal case was great. As I said above, there were no rough edges to worry about and no visible seams. The cutouts were perfect. The feel was smooth and slippery – but I think this is unavoidable in a clear, plastic case. Holster: The Holster seems quite solid by design. The plastic is quite durable and smooth. Once secured, this was very sturdy. Protection: Both the Crystal Case and the Holster offer great protection for the BlackBerry Curve. The Case protects the BlackBerry from scratches (although there is no screen protection on this one) and bumps and bruises. If my BlackBerry were to fall to the ground in this case – my best guess is that the worst case scenario would be the case might crack – but it should absorb the impact and protect the BlackBerry. Put the Blackberry in the Crystal Case and then in the Holster and you might just have the ideal solution for your BlackBerry – protected, but still able to see the color, minimal bulk and “holstered” when desired. Crystal Case: The Seidio Crystal Case seems to be the best of the bunch when it comes to Clear, See Through cases. It is thin, so you have access to all the buttons, convenience keys and ports and it is hard – so it will protect against scratches and bumps. My only gripe with this case is that once put on the BlackBerry, it is no easy task to remove it, which is a required task if you ever need to pull your battery or access your MicroSD card. Holster: The Seidio Rubberized Holster is a great option for those who have a “skinned” case or are using the Seidio Crystal Case. When the BlackBerry is secured in the holster it is very tight and safe. Removing the BlackBerry from the Holster is easy. The rotating clip is also a nice touch.